Frank & Oak’s unsubscribe page allowed me to decide if I wanted fewer emails or if I wanted to completely want to turn off the tap. There is nothing extraneous, there is no login required, the shut-off valve isn’t hidden 2-3 pages down, or buried under a metric ton of encouragement to stay—it’s right there, highlighted in red. Red suggests danger/attention but that’s not what’s happening here. That’s right, unsubscribes are your best friend because the alternative is your worst enemy: spam complaints. 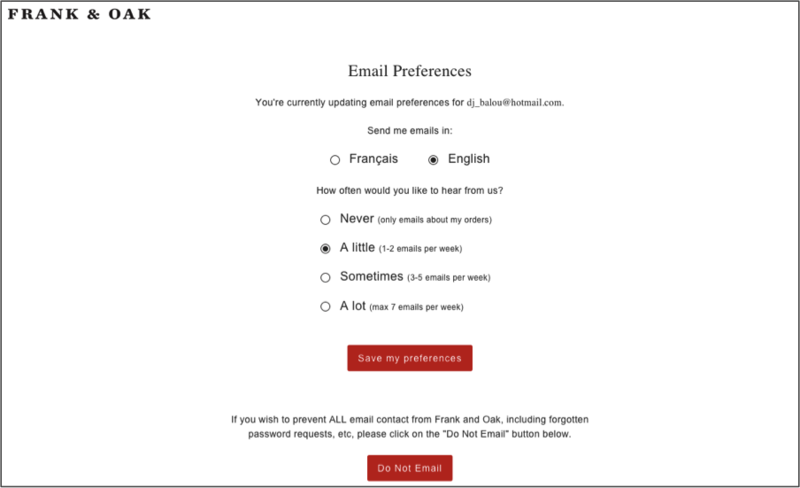 Users who unsubscribe from your email feed might someday come back, or as in my case, be delighted to see a simple page that gives me choice and the ability to control my inbox’s fill rate. If a user can’t unsubscribe easily from your newsletters or promotions because you buried one or two clicks down from the initial page, or obfuscate the unsubscribe mechanism in some other manner then the easiest alternative (to make the mail stop) is to click the spam button. Enough spam complaints and your email may begin to deliver to the spam folder en masse. If enough spam complaints happen on a given domain or IP in a short span of time then the rest of the email may be routed to the spam folder. So which would you rather have? A customer that dials down how often and how many emails you send them or a spam complaint? The choice is yours, however, consider the age in which we live: we’re living among empowered consumers—this includes you. You have a tremendous amount of power to control the conversation that brands have with you. You can shut off their marketing, choose their rivals, never visit a store, or complain on social media and bend the ear of the world. Since the power structure of consumption and advocacy has shifted from the brand to the consumer, you have to apply customer-centric tools and marketing, like this light, efficient and delightful page to let customers quickly make the right choice for their lifestyle (and your brand), versus punishing you for being overzealous in your approach. There’s an old saying: If you love someone, set them free. If they come back they’re yours; if they don’t they never were—that’s what you need to keep in mind when designing your unsubscribe page. Unsubscribers are inevitable in email marketing. They’re often looked at negatively, but we prove how they do a lot of work for marketers by cleaning lists. Discover the daily trials and tribulations of an email marketing manager at an email company. Learn the traits that are essential for this career path.